The North State River Run Party on the River is Wednesday, September 9, through Saturday, September 12. There are 13 shops participating: Thistle Dew Quilt Shoppe, Runs with Scissors (Citrus Heights), Whistle Stop Quilt Shop (Auburn), Sugar Pine Quilt Shop (Grass Valley), Angel Quilters (Lincoln), Sew So Shop (Yuba City), Quilt Corral (Willows), Friends Around the Block (Colusa), The Rabbit Hole (Chico), Debbie's Quilt Shop (Paradise), Morning Star Quilts (Paradise), Blue Iris Quilt Shop (Palo Cedro), and Sew Simple (Redding). Every shop will have a fun party theme (ours is 'Luau') and will be open from 9:00am to 7:00pm each day. There are lots of fabulous prizes, including a grand prize of a Bernina 350PE sewing machine and thirteen first prizes of a $100 gift certificate from one of the participating shops! And....there will be a 15% discount on regularly priced fabric, notions, books, and patterns at each store! So mark your calendar, get a group of your quilting friends together, and start making plans! Four-Patch Chain BOM (full), Sat, Sep 5, -OR- Thu, Sep 10, 10:15 a.m. - 10:45 a.m. Sat, Sep 13, 1:00 - 4:00 p.m.
Baltimore Album, Sun, Sep 13, 10:00 a.m. - 2:00 p.m.
Blankets for Preemies, Fri, Sep 18, 11:00 a.m. - 3:00 p.m.
Handwork Sit & Sew, Mon, Sep 21, 10:00 a.m. - 4:30 p.m.
American Girl Doll Sit & Sew, Wed, Sep23, 1:00 - 4:00 p.m. Disappearing 9-Patch, Diane Matthews, Fri, Sep 25, 10:30 a.m. - 2:30 p.m., $25 class fee, supply list. When you discover the "secret" to the disappearance of the nine-patch block you made, you will be amazed! You will use this fun technique many times - it works great for table toppers to fullâ€‘size quilts. Come see how it's done and have fun making your nine patches “disappear” and “reappear” as a new block in the top you will make in class. Please note that there will not be time in class to finish a whole quilt top. You will be learning the technique only and will be able to make at least four blocks, so you can see how to set them together. You can finish this at home to the size you desire, and then add borders. There is no need to purchase fabric for the borders at this time since you may not be sure of the finished size you want. 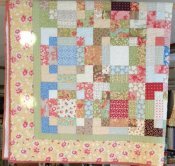 Crazy Quilting - Beginning, Toni Jordan, Sunday, Oct 4, 11:00 a.m. - 3:00 p.m., Sunday, Oct 11 & 18, 11:00 a.m. - 1:00 p.m., $60, supply list. In the first session you will construct a 14" block using a wide variety of fabrics; cottons, silks, tapestries, velvets, linens. In the second session you will start the embellishments. You will learn a variety of embroidery stitches using different threads and techniques. In the third session, you will learn more embroidery stitches and embellishment techniques using buttons, laces, jewelry and other "finds". 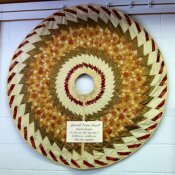 Spiral Tree Skirt, Martha Kunkel, Fri, Oct 23, 10:00 a.m. - 4:00 p.m., $40, supply list. Make this stunning tree skirt using the 25" 9-degree ruler (same ruler used for the Spicy Spiral Table Runner) and a selection of four contrasting fabrics. You'll have a unique and beautiful holiday heirloom! We've received new Bali Chop batiks from Hoffman and several new bolts of Asian fabrics. And, we've enhanced our collection of Hawaiian fabrics for our River Run party them - Luau! They're beautiful! Check out this fun retro collection. 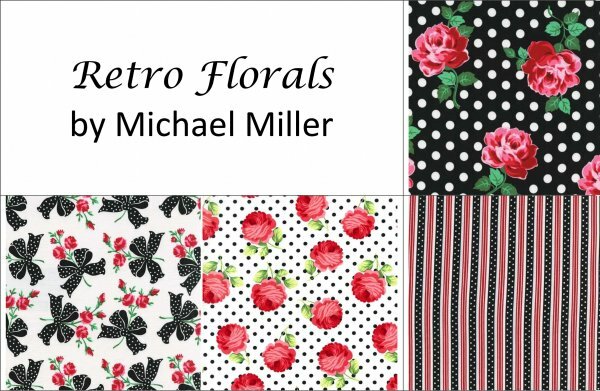 These would make amazing quilts, table runners, aprons, borders for kitchen towels, and garments (think fun skirts).